That's what the Little T Squares is all about. Named for the nearby Little Tennessee River, Little T Squares is the largest square dance club in the Knoxville area, as well as the largest in Tennessee. Our members range in age from kids to senior adults. 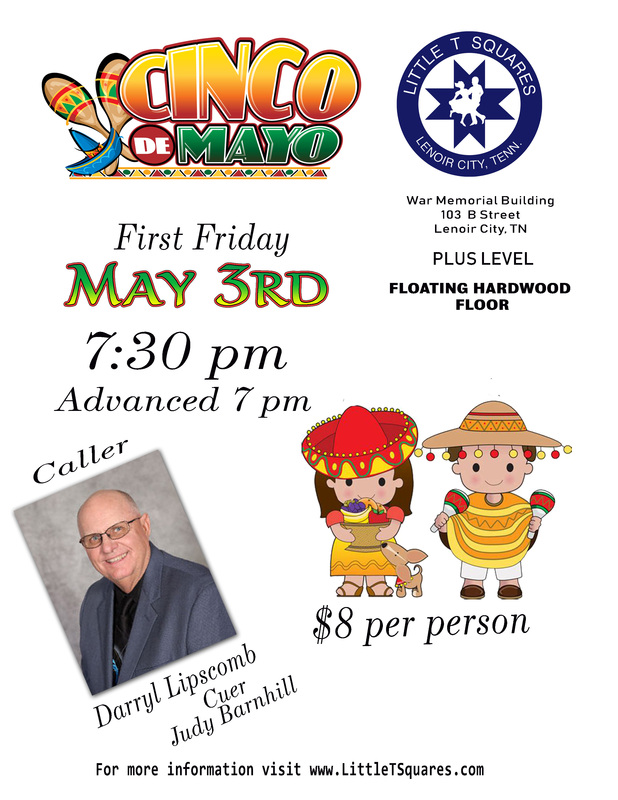 We host a dance most every 1st, 3rd, and 5th Fridays at the Memorial Building in Lenoir City. Occasionally we have special events where we have nearly 200 dancers from all around East Tennessee, lots of special food, and great fun. You can learn more about the Little T Squares by clicking on the About Us button. People square dance to all types of music from Country Western to 50's to pop. Square dance callers sing part of the song and mix in square dance calls while doing it. Click on the Play button below for an example of one style of square dance music. Head on over to our Picture Gallery and check out all the fun people are having. There is a video link at the top of the gallery menu that will take you to our YouTube page with some videos of our dances. Why is Everyone Square Dancing? Do you enjoy people, want to increase your circle of friends, like to party and enjoy all kinds of music and dancing? Want to participate in an easy form of fun and healthy exercise where you'll work up a smile instead of a sweat? Then you would love being part of today's fastest growing form of social dancing: MODERN SQUARE DANCING! Yes, we still Do Si Do, but we also Slip the Clutch, Back Track and Scoot Back. These steps and more will get your "Boots a scootin'" across the dance floor on your very first night. So come on, join the fun - Couples, Singles and Families are all invited. "But I can't dance." Someone once said it should be called "square walking" rather than "square dancing" because you mainly walk in patterns from one place to another. Everyone messes-up at one point or another which leads to laughing and working together to get back on track. Still not convinced? Check out what square dancing is all about.